Nearly one in five kindergartners head to Hamilton County classrooms without any formal child care or prekindergarten program, and those who need it the most are twice as likely to miss out, a local study says. On Monday, the Ochs Center for Metropolitan Studies released its first report on the education experiences students have before starting kindergarten in Hamilton County. Forty percent of students whose mothers did not earn a high school diploma -- those labeled by researchers as most likely to not be prepared for school -- did not attend any pre-k or formal child care program. * 19.5 percent of children were beginning school without any past participation in child care or preschool programs. * 77 percent were in child care or preschool programs between the ages of 3 to 5, compared to 43 percent between the ages of infant to 3. * When children were between infant and 3 years old, 13.3 percent of Hispanic children participated in preschool or childcare compared to 44.2 percent of whites and 49.1 percent of blacks. 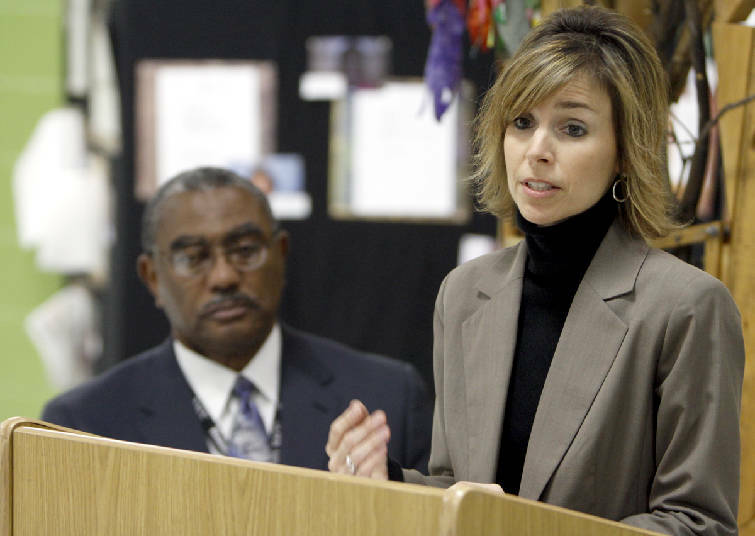 Calvin Donaldson Elementary principal Becky Coleman said the report, released at a news conference Monday at her school, brings to light some important data. "Kindergarten is the new first grade," she said. "So if they're starting out behind ..."
The report states that there also are far fewer Hispanics taking advantage of child care or pre-k as compared with white or black students. Among children 3 years old and younger, 13.3 percent of Hispanic children participated in preschool or child care compared with 44.2 percent of whites and 49.1 percent of blacks. When kindergartners were between 3 and 5 years old, 50.5 percent of Hispanics, 78 percent of whites and 83.4 percent of blacks participated in child care, according to the report. "The degree to which the differences were so dramatic were pretty significant to us," said David Eichenthal, executive director of the Ochs Center. Staff photo by Dan Henry/Chattanooga Times Free Press - Calvin Donaldson Elementary principal Becky Coleman speaks as Dr. Jim Scales listens behind during a press conference held to discuss an Ochs Center report on kindergarten readiness on Monday. The study was based on 2,363 survey responses from Hamilton County parents enrolling their children in kindergarten in fall 2009. Calvin Donaldson kindergarten teacher Tonya Taylor spent five years teaching pre-k and said the preschool experience expands students' vocabularies and teaches them how school works. "Our students have a lack of resources. So for them, pre-k seems to bridge that gap," she said. "It makes my job a little easier." School Superintendent Jim Scales said the district wants to encourage parents to enroll their children in a formal program before entering kindergarten. But schools such as Calvin Donaldson have partnered with more than 200 volunteers to offer tutoring, reading and mentoring to help make up for those without pre-k experience. "This could be a showcase school," he said. Follow Kelli Gauthier on Twitter at twitter.com/gauthierkelli.